Does Cactus V6 II support SMDV – BRiHT-360 in HSS mode? Got this flash already but found that it is not yet supported by Cactus V6 II in HSS mode. In both methods, you will be able to control other off-camera flash units from the V6 II (TX), such as compatible TTL flashes on other V6 II (RX) or Cactus RF60. In Method 2, the SMDV BRiHT 360 is triggered by the Flash Wave 5TX and not by the V6 II (RX). The above methods worked on a Profoto B1 with Air Remote. We have not tested on the SMDV system however the same principles should apply. Please let us know if it works too. I haven't got a SMDV Flash Wave 5TX yet since I'm using a Fujifilm X-Pro2. I could get HSS to work on Cactus RF60, and Nissin i40 as well. I also have a Pentax K-1 as well as Pentax 645Z. I couldn't get them to work yet. 2. Connect V6 II (RX) to SMDV BRiHT360 via 3.5mm sync port. If your studio strobe has a flash duration of 10ms, or 1/100s, at t0.1, it will work. For SMDV, its flash duration is 1/200 - 1/10000. I'm not sure whether this works for me or not. For Profoto B1, I read from web site that its flash duration is 1/11000 - 1/1000. Its flash duration at t0.5. Anyway, thanks for your direction. I'll try SMDV Flash Wave 5TX in Zhao Xiang Guan (Hong Kong) with my setup. I'll post my findings here. As a follow-up to my previous post, I've tried Fujifilm X-Pro2, Pentax K-1 and Pentax 645Z with Cactus V6 II and my SMDV-BRiGT-360 flash. Since HSS of SMDV-BRiGT-360 flash (Canon model) can only be triggered by SMDV Flash Wave 5TX (Canon model), this particular flash trigger must be bought and used together with Cactus V6 II, even though I'm not a Canon owner myself. 1. Mount V6 II (TX) on camera's hot shoe. 2. Mount SMDV Flash Wave 5TX on V6 II (TX)'s hot shoe. 2. Instead of mounting SMDV Flash Wave 5TX on V6 II (TX)'s hot shoe. Mount the flash trigger on a separate RX unit. Whenever the shutter speed of 645Z s raised above 1/125 (X sync speed), 645Z will refuse to fire a flash. There are 2 high speed sync modes. One is Normal HSS, the other one is Power Sync mode. 1. Pentax K-1 works well with both Normal HSS and Power Sync modes. The photos produced by both look alike. 2. Fujifilm X-Pro2 works well only with Power Sync mode. Apparently Normal HSS also works, but there are some noticeable dark bands on on photo. The recommended mode for Fujifilm X-Pro2 is Power Sync. Remember to click the dial wheel to enable Forced HSS. 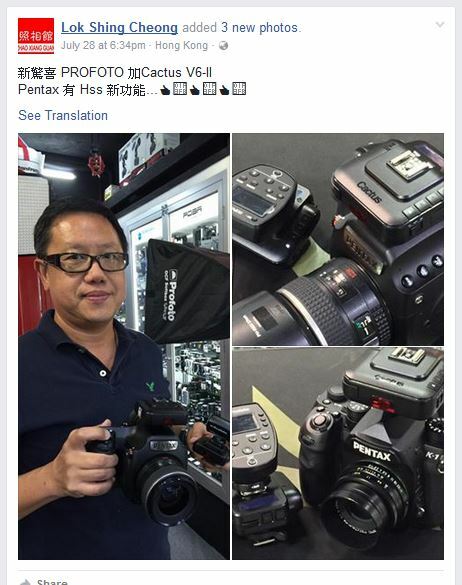 Cactus say the 645Z is supported by the V6II. 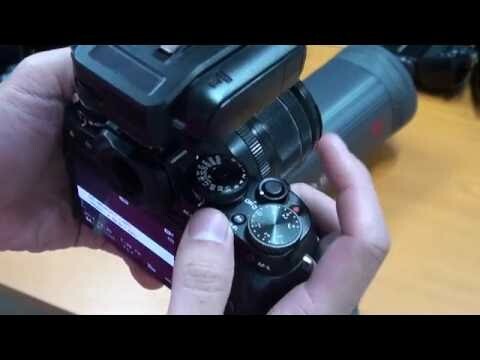 If the auto detect does not work, try selecting "Pentax" as the camera system manually. Antonio, I just picked up the BRiHT at Photokina and I tried the method 2 you suggested above. However, when I put the Flashwave 5 trigger (in my case, it's a Nikon one) on top of the V6 Mk II transmitter and I try to enable TTL passthrough, I get a message saying TTL Systems do not match (and a red flashing light on the TX). This is with the Setup set to Camera = Fujifilm and Flash = Nikon. Also tried with Flash = Manual but same result. All of this is on an X-Pro 2 by the way. Have you tried not using TTL pass-through? Just set the camera system to "Fuji" and the flash system to "Nikon". This should work. Don't forget to use "Forced HSS", though. The TTL pass-through option is only meant for enabling full communication between the camera and a system-dedicated flash that matches the camera. You'll get automatic exposure support for an on-camera flash that way, for instance. However, TTL pass-through is not needed for what you want to do. TTL Pass Through can only be used - when the camera and the flash runs on the same system. Otherwise, a Nikon flash (or flash trigger) won't understand the information being "passed through" from a Fujifilm camera. It would only work with your X-pro2 if SMDV's trigger also runs on Fujifilm system, or you are using a Nikon camera. As for making it work for you, you don't even need to mount the SMDV trigger to any camera / V6 II / strobe. You should be able to use HSS by switching on the HSS mode on the SMDV BRiHT strobe unit. - just connect another V6 II (RX) to the BRiHT via sync cord. Some strobe requires the trigger to turn on HSS, but others don't. You may still control the strobe's power with SMDV's trigger - but held in your hand. Have a try and see if such a connection would work? I can get the BRiHT to fire, but there's a black bar that progresses with the shutter speed, so it looks like it's actually not running in Power Sync. If I try to set the BRiHT to TTL (HSS icon also showing on the BRiHT control panel), it does not even fire at all. Since you are connecting the V6 II RX to the SMDV unit via a sync cable, the flash system should be set to Manual - or just let the V6 II auto-detect it as Manual. Or are you talking about the V6 II TX unit that's mounted on your X-T2? If you don't have any Nikon speedlight mounted as on-camera flash, you don't need to set anything flash system / profile. You don't have to set the SYNC MODE to Power Sync on the V6 II TX, using Normal HSS is fine. Because with HSS turned on in the SMDV unit it will fire a long pulse flash when it receives a signal to fire. Power Sync is really for portable flashes with a hot shoe foot mounted directly on V6 II, not via sync cable. There's no way a strobe unit connected via sync cable can discern between Normal HSS or Power Sync instructions from the TX unit - it simply fires. As soon as I enable Forced HSS (either in Regular HSS mode or Power Sync mode), the flash does not fire anymore. When I disable Forced HSS, the BRiHT fires, but at 1/1000th the frame is completely black. Only at regular sync speeds do I see flash contribution in the image. Is this how you set it up? Yes but that did not work. However, I tried the strange-sounding setup that @mikegor used and that worked! Oh, thanks for confirming that. Sounds like the setup is just like this?